It’s a rough first day for Constable Shane Cooper (Ryan Kwanten). 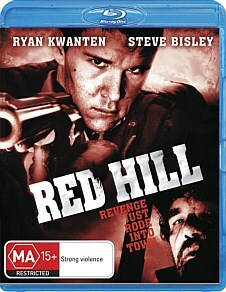 He and his young wife Alice (Claire van der Boom) have just moved to the country town of Red Hill, in the hope of creating a new life for themselves and their unborn child. Constable Cooper has lost his firearm in the move, and after setting out for his first day on the job, he becomes aware that he doesn't even know where the local police station is. Nevertheless, he takes a carefree attitude and a warm smile with him, even if the locals are less than receptive to his good-natured approach. But after just a few hours on this new and remote beat, things take a deadly serious turn when news hits the town that an escaped criminal, Jimmy (Tommy Lewis) is out for revenge against the men who put him away. The town is quickly locked down, with police chief Bill (Steve Bisley) and his men covering the main routes of approach. Cooper, meanwhile, is sent to what they think to be the least likely road that the convicted killer will take. After barely surviving an encounter with the scar-faced criminal, Cooper hurries back to town, to try to save what is left of it from the nightmare that has taken over. Right from the opening shots, this film’s character shines through. The rustic strings and faint hints of didgeridoo make it clear that you couldn’t be anywhere else in the world but Australia. The real hero, at least in the first part of the film, is the landscape itself. Director Patrick Hughes and his crew have done a beautiful job of capturing the wide open spaces and dry, lonely bush. It’s a shame then, that the story fails to reach the same epic heights achieved with the cinematography. Throughout most of the film the characters and dialogue are believable and slightly irreverent, in a good quirky sort of way. Unfortunately it’s when the action starts that holes start to appear. (No pun intended- I’m not talking about bullet holes!) I felt that we weren’t given enough background into this cast of characters to care too much when they died. We get de-sensitised to the violence very early on, as it is presented in such a bleak and meaningless way. 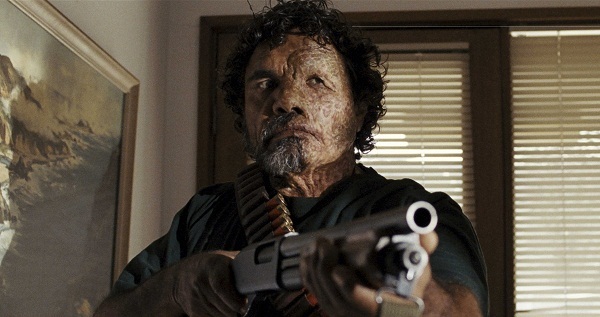 When Jimmy strolls into the local police station and starts blazing away with his shotgun it’s both captivating and shocking. But later on, as he tracks down the men of the town one by one and coldly executes them, it just starts to feel like random, wanton violence. Okay, another one dead. Good-o. When are we going to get to the punch line? Kwanten’s shift in character, from caring family-oriented cop to hard-bitten hero, isn’t entirely convincing. His role, as the sunny-faced nice guy from out of town, is to uncover the truth behind the sudden spate of violence. But the frequent jumps between Jimmy and Cooper are distracting, and the movie probably would have benefited by being told from a single point of view. Towards the climax, those same rustic strings that gave the opening sequences so much character are neglected in favour of the lonely horns that we all recognise from spaghetti westerns. And that’s the root of the problem; this movie desperately wants to be a western, but it doesn’t know quite how to pull it off. Jimmy himself is limited to a single line of dialogue throughout the film. With half of his face invisible behind a scar, he looks like a true monster, and his actions match this façade. It’s exceedingly difficult to care about him or his motivations, because for most of the film he rides around town, shooting people at point-blank range with no twitch of emotion visible on his face. And it has to be said that the sub-plot about a livestock-killing panther roaming through the bush is entirely unnecessary to the story. Although it starts off with good intentions, great cinematography and a lively soundtrack, the writing ultimately lets the film down. While certainly not terrible, Red Hill is an underwhelming experience. Writer/Director Patrick Hughes has a lot of experience creating short films, and this probably would have worked better in a shorter format. As it stands, there isn’t enough content to justify the feature-length running time. While it has some interesting ideas, it ultimately feels like an excuse for a long and gory shoot-out in a remote country town. With some depth to the characters and a more focussed approach, it could have been better.